Dr. Cheryl Willman provided important advice and guidance as Winship was going through its National Cancer Institute Comprehensive Cancer Center application process. 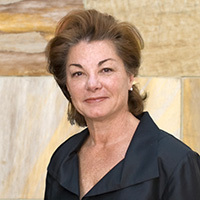 As director and CEO of the University of New Mexico Comprehensive Cancer Center, Cheryl Willman, MD, is a valuable resource for Walter J. Curran, Jr., MD, and other Winship leaders. Willman serves on Winship's External Advisory Board and provided important advice and guidance as Winship was going through its own National Cancer Institute Comprehensive Cancer Center application process. Willman says Winship deserved the prestigious designation: "You serve a very unique population with a significant minority and underserved community that has unique cancer challenges and very significant cancer health disparities. Winship's new NCI Comprehensive Designation is a testament to your success in meeting these challenges. Winship's partnership with Georgia Tech enhances it's ability to integrate innovative physical sciences and technologies to bear on cancer discovery. And finally, Winship has a fantastic cancer clinical trials program, assuring that all Georgians have access to state of the art care and innovative treatments." She explains, "The NCI Comprehensive Cancer Center world is a very small world, and we learn from each other. In my leadership career, it's been a very special opportunity to live in this community of cancer center directors. It's a privilege to have the unusual role of both critiquing and advising at the same time."